We want your visit to be convenient and informative right from the start. We don’t want anything to stand in the way of your achieving a beautiful smile, so we offer as many conveniences as possible. This includes downloadable patient forms you can fill in at home. 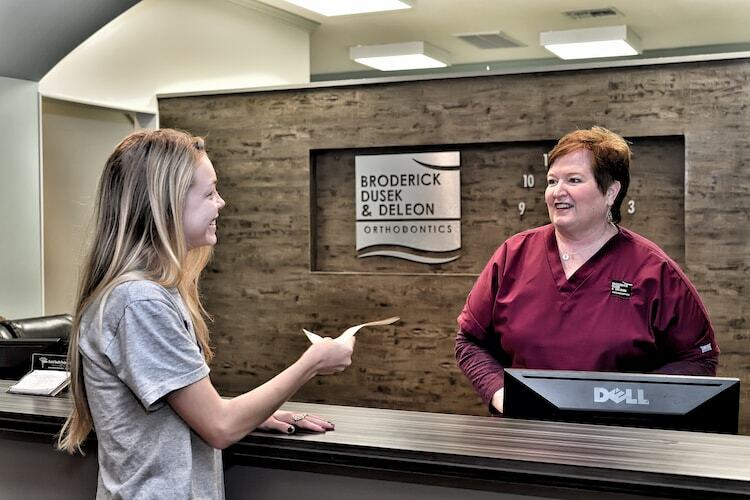 As a courtesy to our patients, we have an insurance coordinator who will assist you with completing and filing insurance forms related to your orthodontic treatment. To get started, simply download and complete the form below. To put you at ease, here is how a typical first experience goes at our offices in Savannah, Wilmington Island, Pooler, Swainsboro, and Bluffton. Unlike many other orthodontic practices, our team of Dr. Broderick, Dr. Dusek, and Dr. DeLeon spend a lot of time with our patients. During your complimentary exam, your orthodontist will get to know you as a person (regardless of age) and discuss your needs. We believe the doctor should be your primary provider of care, performing the exam and providing you with your treatment options. We never force our opinion, but rather identify any issues and give you the best options for your situation. You can then ask us questions (including fees, insurance, etc), learn more about the treatment, and make the selection you are most comfortable with. Our priority is you and making sure you are 100% confident in the treatment we can provide. It really is so simple to get started.